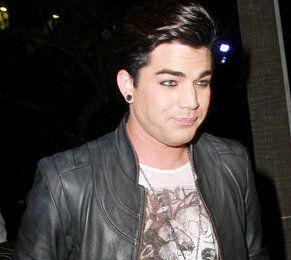 Adam Lambert showed up beyond drunk at Lady Gaga’s surprise 25th birthday party on Sunday night. The 29-year-old singer kept beating on the walls until he’d actually punched a hole in the building’s low ceiling. He also tried to smear the cake in Lady Gaga’s face and put a doll from the cake in her mouth. Then he tried to serenade the birthday girl and Lady Gaga asked the security to kick him out. Adam acknowledged celebratory gesture for Lady Gaga’s B-piñata style.